You may have noticed a different kind of generosity during the run-up to Christmas that focused on supporting the causes we care about. ITV’s #TextSanta campaign raised over £5.5 million for UK-based charities, and #GivingTuesday on 2nd December saw more than £2,500 donated every minute on Visa cards in the UK. These 2 events offered an alternative to the festive flurry of sales, and gave people the platform to donate time, money, or their voice to support a good cause. The government supports a range of fundraising campaigns and these are a fantastic way to give back. We would also like to encourage longer-term volunteering. As civil servants each of us is entitled to at least 1 day of special leave to spend supporting a community activity that matters to you. Volunteering can provide a great development opportunity outside the Civil Service. It can be a chance to use your skills and talents in a new environment, and broaden your horizons. The Community Life Survey showed in 2013 to 2014, 74% of people had volunteered at least once in the last 12 months, and many organisations would not be able to have the positive impact they do without volunteers. We understand that deciding how and where to volunteer might seem like a daunting process but it doesn't have to be. This post will give you some tips and advice on how to choose the best volunteer opportunity for you. 1. A great way to start is to use a volunteering website to find opportunities near where you live. Do-it is one of many national online databases of volunteering opportunities that can help you. 2. Pick something you are passionate about, sport for example. Did you know 7 out of 10 local sports clubs say they need more volunteers? It’s also a great way to be active and learn new skills. Join In is your go to platform for local sports volunteer opportunities. 3. Think about charity trusteeship helping to oversee the work of a local charity. You don't have to be Senior Civil Servant to be a trustee and it can offer excellent experience of strategic leadership. You can find out more at the Charity Commission. 4. Like many other civil servants you could join the Dementia Friends movement. This can open up other opportunities to support some of those that most need help in your local area. 5. Civil Service Local helps connect local groups with civil servants looking to help out. Their blog has regular opportunities and they team would be delighted to help you find the right placement. It's important to think about volunteering as a two-way relationship, involving you and those that you are helping. A successful program will see a mutual benefit for both you and your chosen cause. If you find something you're good at, you will feel more confident and comfortable. This also maximises the outcomes for those you're helping out. To start with think about professional skills such as project management, finance or communications, and how they could be used. Whatever you are doing, whether you are going through an intermediary organisation or directly with a charity, make sure you ask lots of questions to understand how your role will support the amazing work they do. And don’t be shy about telling others what you are doing - it will encourage colleagues, friends and family to follow your lead. For those in Scotland I would strongly suggest that you think about service on the Children's Panel, helping to oversee the way in which our most vulnerable children are protected and supported. You can make a real difference to those who need it most in our community. Just Google Children's Panel for information. "Team London" set up after the 2012 Games to keep the volunteering sprirt going, gives info on a wide range of opportunities in the London area. My first experience, set up via this site, was voulnteering at the Cancer Research Shine London Walk, and I'm doing something similar at this year's London marathon. Does anybody know how I can arrange a 'team' volunteering event? Most of the sites I have looked at are designed for individauls but I want to arrange something that my team can do together. Is it possible to volunteer as a group? Andrew, the Children's Panel looks incredibly rewarding and making a difference in children's lives. From your own experience, what is the time commitment in practice, and do you get adequate time off work (from the civil service)? I have volunteered for over 15 years for St John ambulance working with young people and in the community providing training in Life skills including First aid for all. Over the years the civil service has not recongnised what i do and the Voluneetring leave has never applied as i could not link to my actual job.even though i am a first aider at work and the civil service has benefitted. I have always had to take my own leave and time off. I started volunteering 1 year ago with the Fire and Recue Service in Dorset. I started initially to enhance my CV as I was coming to the end of my military career, but I have found that it is a great way to give something back to the community I live in. Dorset Fire and Rescue Service seem to be involved in everything from teaching primary school children about fire safety to giving assistance to other charities like 'Dementia Friends'. In April I hope to be volunteering as a development coach with the 'Princes Trust' and hopefully will be able to use 'Special Leave to do this. This is a great opportunity for me to use my skills and experience to help others, and it will also help me to develop my skills for my job in the 'Civil Service'. I started volunteering as a governor of a local primary school about six year ago and now seat as the Chair of governors for the last three years. I have found it very rewarding to give back to my community and be a part of the lives of our children. I have gained lots of experience in this strategic role and have been involved in the recent restructuring of the school during which involved letting staff go and meeting the union to explain the reasons for the decisions the governing body made. I have learnt how to negotiate with different stakeholders, lead with conviction and make decisions that are not popular. With my background in compliance work I have transferred my skills to the role and it has benefitted the school greatly. I was given time from work as special leave which I am grateful for. If you have the spare capacity volunteering can be very rewarding. I was looking to volunteer some time to the homeless over the Christmas period but really struggled to find any information locally. I was pleased to come accross Richard Hill's article this morning and will be looking into doing some voluntary work using the links provided to help me find something near to me. As most adult volunteers in Scouting I got roped in with the immortal phrase 'it's only an hour a week' when my son moved from Beaver Scouts to Cub Scouts at the age of 8.... nearly 14 years later he has left Scouting, and I am now serving my second year as District Commissioner for Scouting in the CRAI (Caerphilly, Rhymney And Islwyn) Scout District. And it's way over the 'hour a week'! Being responsible for over 600 members within Scouting aged from 6 years to 82 years, I get my motivation and enjoyment from seeing young people learn new skills, gain badges that they are very proud to wear on their uniform, leaders achieving awards such as DofE as well as long service awards bestowed by the Scout Association. My philosophy? Simple if we can make a difference to an individual that stops them getting into trouble later in life, helps them get the job of their dream, or even create the Scouting leaders of the future then I know that my many hours spent volunteering have been wisely spent. My goal as District Commissioner is to open up a Scout Group in our local Special Needs School solely for the children in that school as they do not have the opportunity to join main stream groups due to their severe disabilities. As a profoundly deaf individual I know how hard it is to be intergrated into society with a disability and be able to join in as an equal individual. 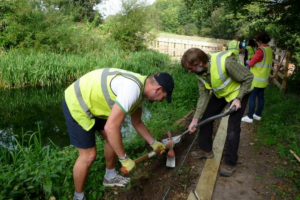 Looking for suitable volunteering opportunities? 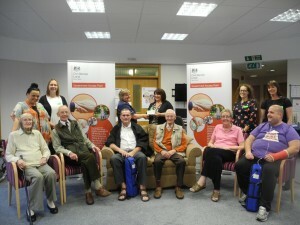 Speak to your local Business in the Community Business Connector; you can find them on http://www.bitc.org.uk/programmes/business-connectors Quite a few are seconded from the Civil Service itself. Business Connectors work with local grassrooot charities and community organisations where volunteering can really make a difference. They should be able to point you in the right direction. Of course if you work for DWP dont forget Community 10000 too as was highlighted in an earlier post. Volunteering is always rewarding. For last 4 years I have been helping serve hot food to homeless people every Sunday. You learn to appreciate how much better of you are than many in this world.